Relief of symptoms of cramps and pains in lower back and legs. 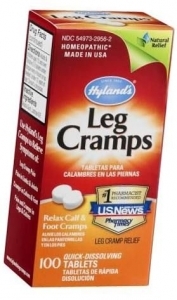 Hyland's Leg Cramps is a traditional homeopathic formula for the relief of symptoms of cramps and pains in lower back and legs often made worse by damp weather. Working without contraindications or side effects, Hyland's Leg Cramps stimulates your body's natural healing response to relieve symptoms. Hyland's Leg Cramps is safe for adults and can be used in conjunction with other medications. If symptoms persist for more than seven days or worsen, contact a licensed health care professional. As with any drug, if you are pregnant or nursing a baby, seek the advice of a licensed health care professional before using this product. Do not use if pregnant, sensitive to quinine or under 12 years of age. Keep this and all medications out of the reach of children. In case of accidental overdose, contact a poison control center immediately. In case of emergency, the manufacturer may be reached 24 hours a day, 7 days a week at 800/624-9659.